Nice work on personalizing your site! Now that it’s been personalized, it’s time to attach a domain so you can show it off! Note: If you’d like, you can send us your login info to your domain provider on the form at the bottom of this page. Click here to skip below. Or you can follow the tutorial below if you’d prefer keeping your login information private. We’re here for you either way and are more than happy to dive in with you. 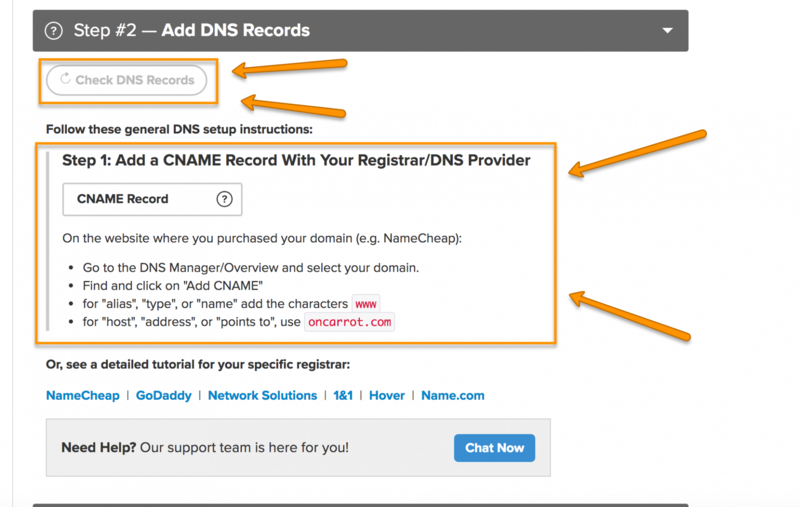 In this tutorial we’re going to show you how to attach your custom domain to your Carrot site! Attaching your domain to your site is one of the most important things you’ll do since it’s what actually makes your site viewable to the public. You can have your domain be whatever you want, as long as you own that domain! If you’re looking for a site to purchase your domain at, we strongly recommend Namecheap since they’re easy to work with, and they don’t try to upsell you like crazy! *You may find your registrar’s support team asking for an “IP Address” to attach the domain name. We use a cnames record to attach domain names because using IP Addresses means a systems servers must remain the same and ours do not and flux with incoming traffic and other updates. To ensure domain names always work, please use a cname to attach the domain to your site. Step 1: Sign in and click the green “Add Custom Domain” button. Step 3: Update Your Registrar’s DNS Settings by logging into your registrar and changing them there. *The steps here are generic so they work for as many domain providers as possible. The individual verbiage your domain registrar will use may be slightly different than the steps we’ve outlined in the picture above, but the instructions above will be applicable! *Your SSL is what makes your site read as secure. Carrot automatically puts one on your site when you sign up, and there’s no need for you to actually do anything to get it on your site. It can take up to 24 hours before it applies to your site, but it’s usually pretty quick. People will still be able to see your site before it kicks in as well, so at this point, you don’t even have to wait to drive traffic to your new site! If you have systems you are currently using, there’s one more step in this process to tie everything together. We know these can be technical and are happy to help get over this hurdle. Let us attach the domain for you at no charge. If other, which company was it? This would usually be titled username and password. Is there a two factor authentication required? Do you have a custom email with that domain?